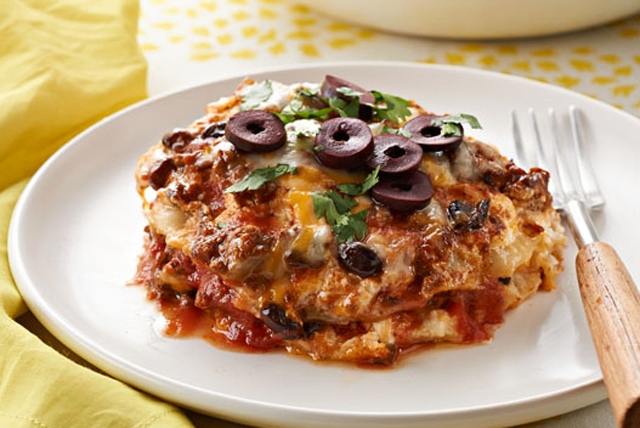 The good news for the family is that they're having both enchiladas and lasagna tonight. The great news for you: It's an easy slow-cooker recipe. Brown meat in large skillet; drain. Stir in enchilada sauce, beans and tomatoes. Mix cream cheese and milk in medium bowl until blended. Stir in 1-1/2 cups shredded cheese. Spoon 2 cups meat sauce into slow cooker; top with layers of half each of the noodles (broken to fit) and cheese mixture. Cover with 2 cups meat sauce; top with remaining noodles (broken to fit), cheese mixture and meat sauce. Cover with lid. Cook on LOW 4 to 6 hours or until liquid is absorbed. Sprinkle with remaining shredded cheese; let stand, covered, 10 min. or until melted. Uncover; let stand 15 to 20 min. before serving. Serve topped with olives and cilantro.